This is my first McManus book. I know other’s have probably already read One of Us is Lying, but not me. So I’m approaching Two Can Keep a Secret from a completely new angle. And I really liked it! I was surprised by so many things, which I really appreciate in mysteries. What I love about mysteries and thrillers, is how clever they have to be. Think about it. With science fiction or fantasy, you’re mostly reading with an open head and heart. There’s a level of disbelief sometimes, but you suspend it to get swept away to new places. But with mysteries, you question everything from the beginning. You’re trying to be a detective, to see holes, uncover secrets, and trust no one. 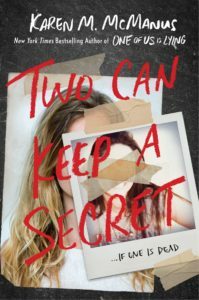 So the fact that I was surprised by many of the twists in Two Can Keep a Secret is a great sign of a mystery. But what really made me appreciate Two Can Keep a Secret are the little touches. I adored how the theme of family was multiplied, refracted, and reflected. Whether it be in sets of twins, or siblings, or even families that were growing. Family was such a strong motivation and connection in the book. Everything from the reason Ellery and Ezra are in Echo Ridge, all the way to their mother’s secrets. I do want to mention that our main characters are biracial, white and Latinx. This is revealed a little later in the book, not as a spoiler per say, but their mother says she had a one night stand with someone named Jose or Jorge. Additionally, one of the twins is gay, while another side character is Korean and bisexual. I want to mention the Korean side character specifically because something that I liked was that the character, specifically her older sister, talks about how when you are minority in a small town, you feel a pressure to be perfect. It’s just one conversation, so not a huge part of the story, but something that I really appreciated. Especially as I grew up adopted, but also in an area where there were not very many other Asian families. While I was drawn in by the mystery, pulled along by the twists and secrets, what I really appreciated was the way family is discussed in the book. Whether it be slightly abnormal, with Ellery’s mom, Sadie, treating them more like siblings than a mother, or patchwork families and new step-fathers like Malcom, family is incredibly important. McManus plays with all these intersecting images. Ellery and Ezra, Sadie and her twin, and the concept of parenthood. We observe all these varying pictures of family, how it could be, and the ways they interact. And through this we see the ways it can bring us together, make us stronger, or motivate us to keep their secrets. Can we really live without our family? What does it do to a family when we lose someone? When they are murdered? Or when they disappear? McManus plays with all of these questions in varied ways and I really enjoyed witnessing how they evolve and developed. Two Can Keep a Secret begins with a murder, and ends with a bombshell. It will keep you guessing until the very last page. It mixes small town dynamics, family secrets, and the impact of power and influence. All while weaving stories of love, friendship, and family. Now that I’m done with Two Can Keep a Secret I definitely want to read One of Us is Lying. Find Two Can Keep a Secret on Goodreads, Amazon, Indiebound & The Book Depository. What author did you discover and then go back to read their earlier books?